These little morsels will be the talk of your holiday cocktail party. the sweet-salt balance is subtle enough to compliment everything from champagne to your most complicated mixological concoction. Allumette is the classic term for strips of puff pastry. The word means matchstick, but these are certainly not meant to be that thin. Aim for creating small, thin, bite-sized rectangles. 1 teaspoon unrefined sea salt—try Halen Mōn, flor de sal, a smoked salt, or a salt infused with shitake or truffles. Heat oil in a large, heavy skillet over high heat. Add onions, reduce heat, and cook, stirring, for 5 minutes, until the onions begin to sweat and soften. Cover the pan and cook, stirring occasionally, over low heat until they begin to color—about 30 minutes. Add ½ teaspoon of the salt, the pepper, the bay and thyme. Cover and continue to cook another 30 minutes. Add sugar, wine, and vinegars. Increase heat and bring to a boil, stirring, for 3-5 minutes. Reduce heat to as the liquid reduces, and the onions are creamy and sticky. Preheat the oven to 450° F. Line a baking sheet with parchment paper and coat it with pan spray. Whisk together the egg and water to make an egg wash. Open the defrosted frozen puff pastry into a rectangle and rollout slightly, to flatten. You don’t need to reduce the thickness too much—it should be about ¼ inch thick. Brush the surface with the egg wash. Set it in the freezer for 5 minutes so that the dough stays firm when cut. sing a pastry wheel (aka pizza cutter) cut the chilled, egg washed puff pastry into ½ -inch-wide by 3-inch-long strips. Place them on the prepared baking sheet, about ½-inch apart. 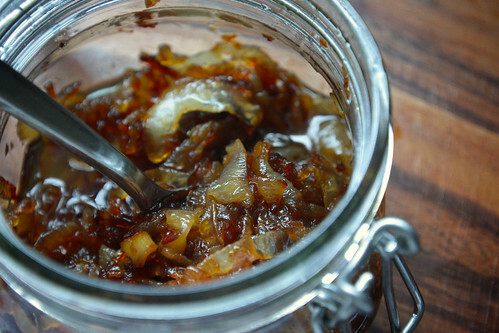 Top each wih a small dollop of onion jam, and a sprinkle of sea salt. Chill again for 5 -10 minutes. Bake until golden and puffed, about 15 minutes. Rotate the pan as necessary for even browning. Cool slightly, then arrange on a platter and serve.